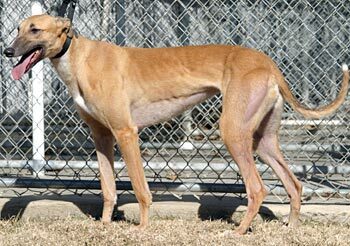 Lizzy, aka Lizzy Swell, is a beautiful, almost 2 year old red female born May 24, 2006. Her sire is Crawdaddy, making her grandsire the late famous Gable Dodge, and her dam is CTW Sleek Molly, making her grandsire Molotov. 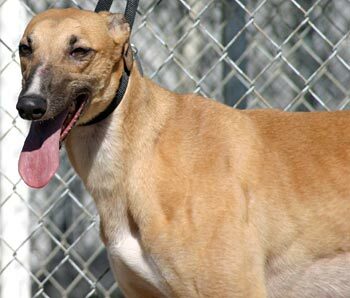 With this heritage, Lizzy's racing future had grand hopes; however, after only 9 races at the Corpus Christi Greyhound Track and ending at Valley Race Park in Harlingen, TX, on January 24, 2008, Lizzy is ready to find her forever home! Lizzy's cat test: This cute little live-wire was all over the place...just not all over the cat. She got a sniff with the muzzle, then decided she wasn't interested. When re-introduced without the muzzle, the cat gave her two gentle taps on the nose with his paw then looked like "is there something else I'm supposed to do with this?" Lizzie got free roam of the house (very closely supervised) and each time she came upon the cat, she stopped about three feet away and turned in another direction. She did that on-leash, too, which is the only reason she was trusted without.